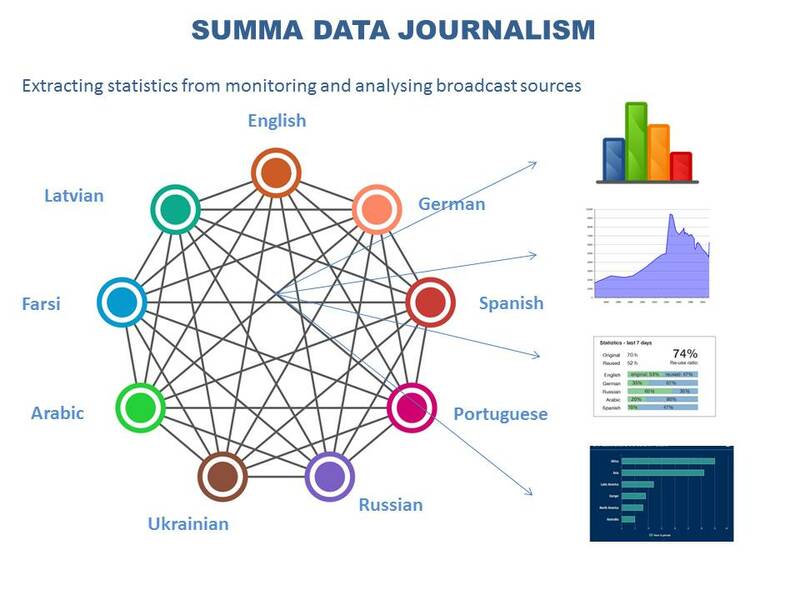 SUMMA develops a journalistic editorial tool that uses language technologies such as speech-to-text, machine translation, summarisation, storytelling, semantic parsing, to enhance broadcast content. 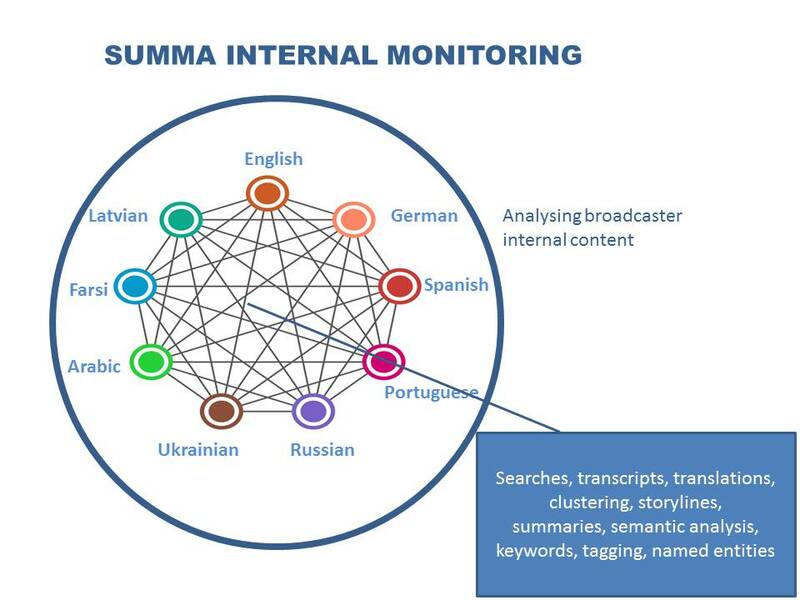 The SUMMA project is built around three use cases for the two principal user partners/broadcasters in the project, i.e., BBC and Deutsche Welle. These three use cases use a common platform, with shared components and systems, for efficient development and consistent results. To accommodate specific user partner internal requirements, a dashboard will be set on top of the common platform, allowing for adjustments and customised views. External Monitoring is the primary use case for BBC Monitoring. Monitoring journalists have a detailed expert knowledge of their relevant media landscape, and look for emerging political and societal themes. SUMMA potentially offers great benefits to these journalists whose are currently struggling to adequately monitor the large, diverse and rapidly growing number of media sources. SUMMA can discover relevant news stories and storylines of interest to the user and can also act as an alert for breaking news events, allowing them to focus more time on analysis and less on time on discovery. Additional benefits of the SUMMA system centre around trend analysis, the ability to save material of interest and extra functionality around viewing of audiovisual clips. Deutsche Welle focuses on the internal monitoring use case, i.e. monitoring and analysing Deutsche Welle content production among its 30 languages. 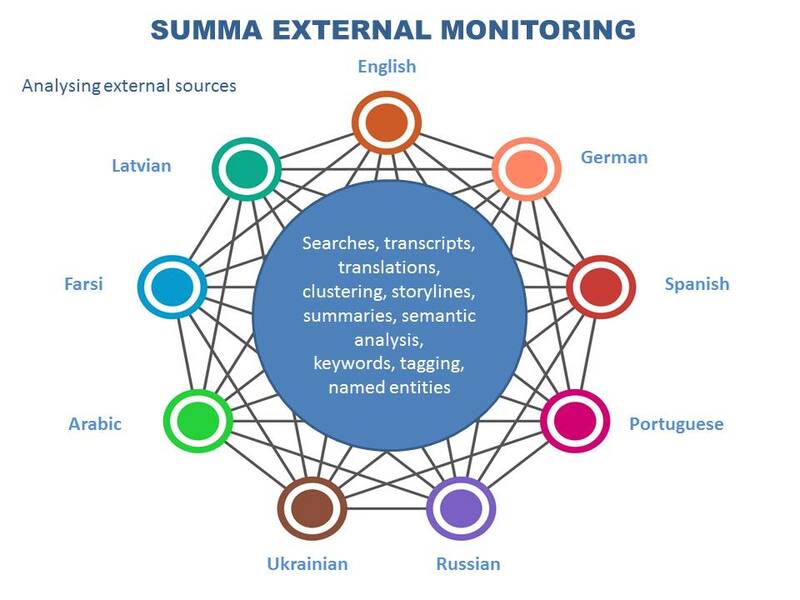 The support offered by the SUMMA system will be primarily beneficial as a communication tool between language departments to support fast cross-language publication and as a summarisation tool for the heads of language and regional departments to support the manual process of ’bubbling up’ relevant stories. By introducing SUMMA as a parallel workflow into the process, it is thought that communication paths can be shortened from hours to minutes while maintaining a much clearer view on the organisation’s news output. However, at the same time, there is a need for external monitoring, bringing local breaking news directly from the target area to the respective language department. Therefore, Deutsche Welle aims at developing a combined internal and external monitoring tool. In addition to the two principal use cases (internal and external monitoring), a third one is envisaged, i.e. data journalism. This will use the output of the SUMMA integrated platform built for the two monitoring use cases to extract measurable and statistical data and visualise that data for either monitoring or journalistic production purposes. This will include, for instance, analyses with figures on channels and sources, topical coverage by language, reuse of content through machine translation, storyline coverage, interest shown in particular content, user group interest and activities, etc. In addition, the user partners developed additional applications catering for specific user scenarios. BBC has developed three applications out of the SUMMA platform: Speedboat – external media monitoring, Sandcastle – internal media monitoring, Monsoon – fact checking for external media monitoring. DW customised applications include SUMMA Data Dashboard, Slack Chat Bot Module, and Social Media Analyser. The two participating broadcasters see major benefits in applying either the fully integrated platform or some components in a customised manner, for both internal and external monitoring. How Can SUMMA Help the Journalist/Monitor? 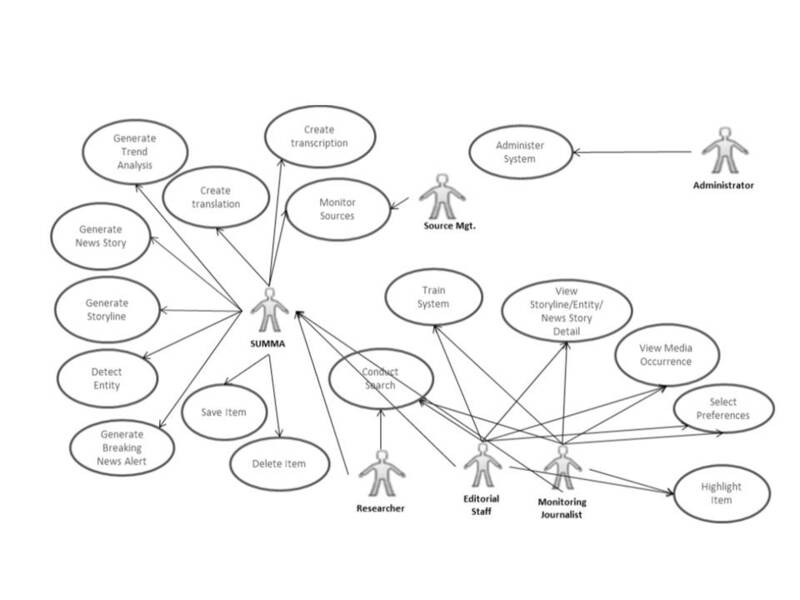 The image below shows what actions the SUMMA system can take to help journalists, monitors, researchers, editors, and heads of departments in their work.